This time, it is the workers of the Haft Tapeh that after several years of strikes, struggle and enduring all the hardships, arrests and beatings of their representatives, have stepped up their struggle and reorganised themselves. Despite the great efforts of the leaders of the Islamic Republic to make use of the opportunity provided by United States pulling out of the Joint Comprehensive Plan of Action (JCPOA) for nationalist mobilisation of the people, and despite the blathering of the opposition and the call for national unity and defence of the homeland against the bullying of the Trump government, and more importantly, despite the threats of the Islamic Republican regime and the brutal repression of every workers’ movement, not only have the Iranian workers’ strikes and demonstrations become widespread, but, in recent weeks, they have also demonstrated their dignity and magnificent revolutionary potential for all to see. Following that, in spite of the issuing of medieval sentences and the punishment of the Hepco workers with lashes, the beating of workers' representatives, arrests of the representatives of the striking teachers, the execution of the Kurdish militants... the struggles and strikes and the demonstrations of the workers has extended many times over. This courageous speech is not only a blow to the Islamic Republic of Iran's tough and imperialist image and not only has demonstrated the indefatigable character of the working class of Iran in front of the opposition groupings of all types, but also, and more importantly, has ignited hope for the future in the hearts of not just thousands, but millions of workers and toilers in Iran. The future belongs to the soviets. We will talk about these differences of opinion as well as some other points below. But for the time being, we would like to briefly note the other two strengths of this mass meeting and its demonstrations, which took place after a few days in front of the governor of the city. Demonstrations that were also attended by other workers and their families from the city of Shush. They cried out for the solidarity and unity with other workplaces and cities that are facing similar issues with the management. In particular with the current dispute and strike that is taking place in the Foolad steel factory in the nearby city of Ahvaz. The slogan "Long live the unity of Foolad and Haft Tapeh", broke the barriers to class unity and solidarity. This was well received by Foolad's workers and the next day they responded with the same slogans in their demonstration. One of the women workers' speeches7 was another magnificent highlight of this demonstration. It not only represented the active participation of women workers in struggles, but also gave a true picture of the double oppression of women in today's Iran which has been presented differently by the mainstream media as a mere gender issue. 1. In this speech, individualism within the working-class movement is rightly rejected. This is most likely due to their own organisational experience, where a few years ago one of their delegates operated outside his mandate, and was rightly dismissed at the time. In the bourgeois parliamentary system, being a representative means passing power to one individual for many years, during which the elected representative is not bound to fulfil any obligations to voters. In contrast, in the workers’ movement, in the concept of soviet democracy, the delegate only has the authority for a specific action and practice, and is re-callable at any time, by those who elected them. 2. Under capitalism whether the state, through nationalisation, or a private individual owns a unit of production is immaterial and support for one or the other has no place in workers’ demands. It seems that this is the biggest danger that threatens the recent protests. However the history of the company itself, and the past illusions of their representatives about subsidies under Ahmadinejad's government provides enough experience for militant workers not to fall to this trap again. Production can only be socialised once the workers have abolished the law of value and money. 4. And we should not forget that the setting up of class wide-bodies like workers’ committees, cooperatives and above all soviets is not the end of the matter. There are plenty of examples in history where soviets have failed because they came to be dominated by reactionaries.9 The soviets are only the arena in which the fight for an entirely new way of doing things takes place. Alongside them the working class which is on its way to revolution has to forge an international and internationalist political party which encapsulates all the past lessons of working class struggle into a communist programme. It is with this that the party fights in the soviets or other class-wide bodies against all the forces which a dying mode of production will throw against the working class. Only in an intransigent fight against all aspects of capitalism will the proletariat succeed in shaking off the shackles of exploitation. 5. The World Party of the Proletariat or whatever the future international is called, will be the product of those emerging from today’s struggles linking up with the revolutionary traditions of the past, including ours in the Internationalist Communist Tendency. That party is not a government in waiting, and the working class as a whole does not delegate its power to it. The Party’s tasks are to fight for the communist programme in the soviets but above all to concentrate on the extension of the world revolution until capitalism is wiped off the face of the planet and a new society of freely associated producers will work together to abolish armies, national frontiers and wars. It will be a society which manages the planet and ends its environmental degradation, where the motto “from each according to their ability, to each according to their need” will rule. 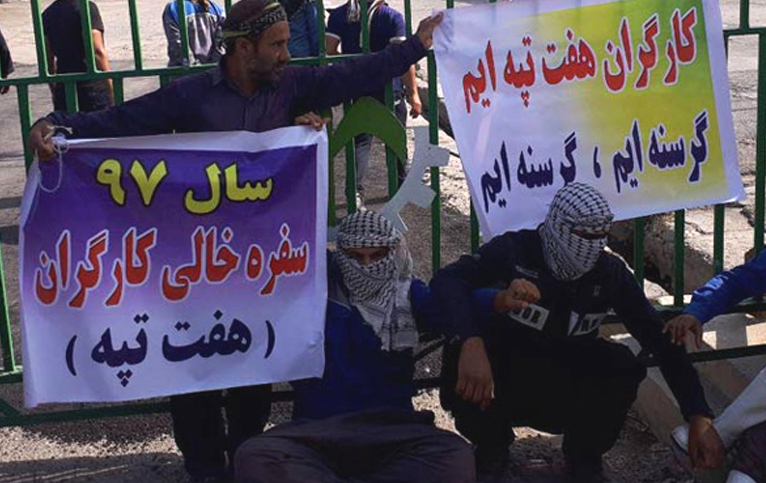 Iran: What after the repression of the Haft Tapeh workers and the steelworkers in Ahvaz? Our alternative is a Soviet, a collective one. We are not person-centred and we do not want individualism. Individualists, nationalists, racists and reactionaries do not associate yourselves with us.